The diversifying benefits of core bonds are more important than ever. Investors may be concerned that the recent Fed rate hikes may weigh on bond prices in the near-term, but it’s important to remember that the diversifying potential of bonds can add resiliency to a portfolio. While bond prices typically fall when interest rates rise, yields also rise – and yields have indeed reset higher, as shown in the first chart. Across fixed income, starting yields have been a good indicator of forward-looking returns. As the first chart shows, yields have risen to more attractive levels over the last couple years. At over 3%, the return potential for bonds is higher today than it has been in years. In this aging expansion investors can also look to core bonds to diversify their risk assets while still getting rewarded for holding bonds. With volatility tracking higher and elevated uncertainty on the longer-term horizon, many investors may consider de-risking their equity exposure. The second chart shows that a 60/40 stock/bond portfolio (green dot) may be an attractive option, because compared to a 100% stock portfolio (red dot), it has historically meaningfully reduced the volatility of the portfolio while maintaining similar returns. With a longer-term mindset and an actively managed approach, an allocation into core bonds can help investors de-risk their portfolios while potentially earning attractive yields and higher returns than cash with a modest increase in risk. Resources and strategies to help you stay ahead of the changing interest rate environment. There may be a place for passive, but it’s not bonds. Is much of the expected rise in rates behind us? 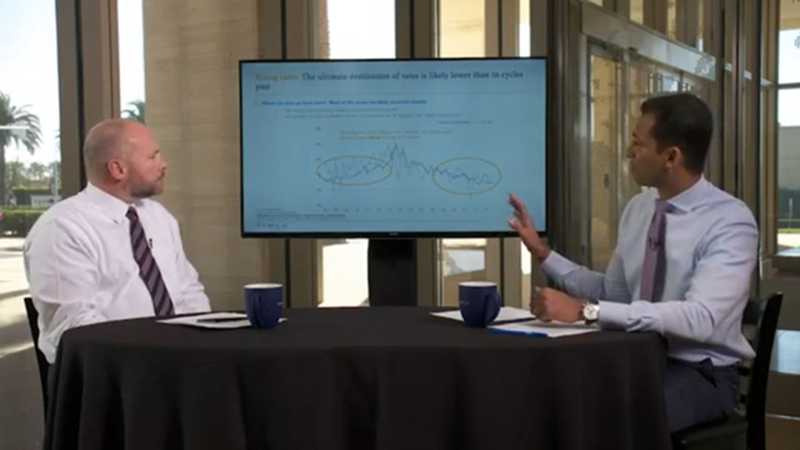 Scott Mather, CIO of U.S. core strategies and Anmol Sinha, fixed income strategist, discuss the path for rates in 2018 and beyond. For PIMCO’s latest views on interest rates, please visit: pimco.com/risinginterestrates.